Key roads across Edinburgh will be closed to traffic once a month in a Scottish first, while the public will be asked what they think of radical plans to potentially restrict vehicles in the city centre. Councillors today agreed to approve the roll-out of its Open Streets programme on the first Sunday of every month between 10am and 5pm – despite concerns from the Conservatives that a “more cautious and data-driven approach” should be taken. 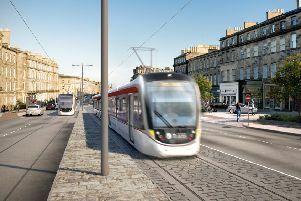 Plans for a Low Emission Zone (LEZ) could “leave a legacy” for future generations as the council will carry out an eight-week public consultation on how to shape the future of transport in Edinburgh. A prospectus outlining three visions, including a radical approach where the city centre would be “largely traffic-free”, will form the start of a long consultation process with the public. No decision has been taken yet on which roads will close in the Open Streets programme, which will also act as a test for any future restrictions on vehicles in certain parts of the city. The closures could include “key parts of the city centre and town centres” across the Capital. The council’s eight town centres are Corstorphine, Gorgie and Dalry, Leith and Leith Walk, Morningside and Bruntsfield, Nicolson Street and Clerk Street, Portobello, Stockbridge and Tollcross. Green Cllr Chas Booth welcomed the bold proposals, but called for a “hybrid approach” to the LEZ plans, so that areas outside the city centre are also included. Liberal Democrat Cllr Gillian Gloyer agreed, raising worries drivers could end up “dumping polluting vehicles on the periphery of the city”. Conservatives voted against moving forward the plans for regular Open Streets days, citing a lack of evidence of road closures to air pollution levels. Cllr Nick Cook called for a “high level of public confidence” in the plans and an “assurance that this is what the public and businesses want”. He said: “We are in a situation where we are using anecdotal evidence.” The council will bring forward proposals later in the year for which routes could be closed. Vice transport and environment convener, Cllr Karen Doran, said: “There’s no doubt that for many years the city has been crying out for change.” The first Open Streets events could take place early next year.